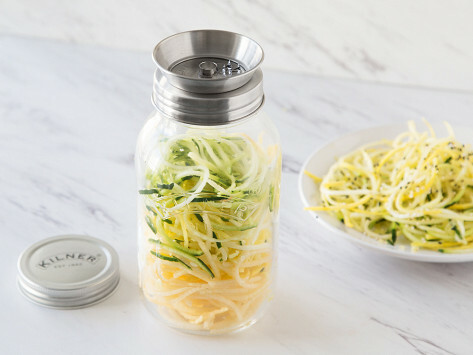 This sleek, stainless steel tool twists your hard vegetables into spiral strips and conveniently catches them all in a sturdy jar—for later or right now. With the right ingredients and condiments, these veggie ribbons can be a healthy alternative to pasta. Make the most out of your carrots, beets, zucchinis, and squash. Dimensions: 8.39" x 3.64" x 9.65"
Did not work as I thought it would. I purchased another that was much easier to use and did more things. Too limited in its use. a lot more appealing. Recommend. I enjoy making strings for a new look in salad! 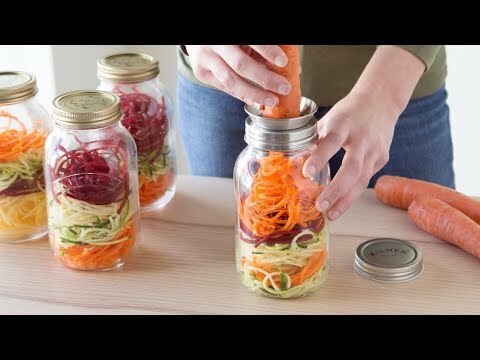 Works great to add veggies to bulk out canned soup too! I love it, easy to use and I have arthritis in my hands. Besides spiraling and collecting your veggies into one streamlined twist, you’ll reap the less-starchy, healthy benefits.